George Hadden was the son of John and Ellen Hadden, of Farriter, Cabragh, County Tyrone. George was born on 28th December 1886 in Tyrone. His father was a farmer. George emigrated to Canada. 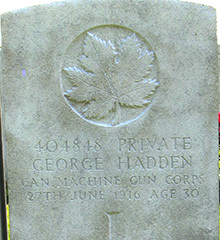 George Hadden was with the Toronto Police Force for nearly three years until 1915. He was then employed by the Toronto Harbour Commission as a surveyor. George Hadden enlisted with the 35th Battalion of the Canadian Infantry on 10th June 1915 at Niagora. He gives his next of kin as his mother. He was not married. He later transferred to the Canadian Machine Gun Corps after going overseas in October 1915. 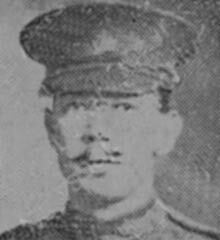 Lance Corporal George Hadden, who was wounded on 22 June, died a few days later of his Wounds on 27th June 1916. He was aged 29.